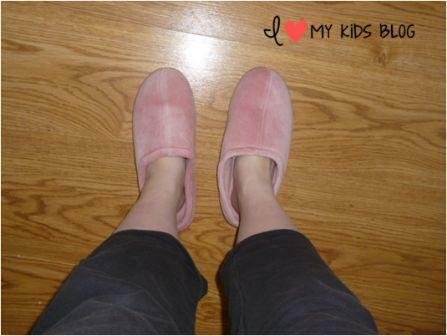 I am nearly 8 months pregnant and have fallen in love my Nature’s Sleep slippers. Before I got these slippers, my back and feet hurt ALL the time! My new slippers are closed toe memory foam slippers really absorb all the extra pressure on my feet! These slippers couldn’t have arrived at a better time. I received them on Thursday as I was prepping for a busy weekend of baking and entertaining. That night I had planned to bake treats for Teacher’s Appreciation Week, a snack to share for the after school spring program social, an apple pie/chocolate chip cookies/rice krispies/puppy chow for a church bake sale, AND peanut butter truffles for a baby shower I was hosting on Saturday. I had already spent 6 hours on my feet waiting on tables at a local restaurant that day and could hardly walk by the time I got home. I didn’t know how my body was going to handle all my extra pregnancy weight while I baked well into the night on my already sore feet. 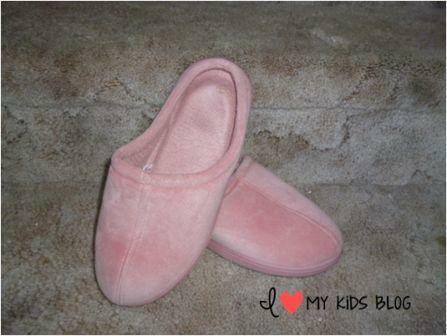 I owned these slippers about 12 seconds before they were on my feet–I had to get busy if I ever wanted to get to bed! Nature’s Sleep slippers come in 4 different sizes: small, medium, large and extra large. I used the size chart on their site to determine that I needed a medium pair. When I tried them on they were a tad big, but I knew the small ones would have been too small, so I was pleased enough with the fit, although I have to make a conscious effort to carefully walk down any set of stairs since they are a bit big. The slippers come in a few different colors and 2 different styles. Open toe and closed toe like I chose. They are soft and comfortable to wear. The very bottom is covered in thermoplastic rubber which makes these great for indoor or outdoor use! The sole of the slippers are memory foam which conform to your foot and absorb pressure and impact. Which is just what I needed for my crazy baking extravaganza that night. I am happy to report to you that not only did I get relief from my already aching feet and back but I was able to accomplish every task on my to do list and by the time I went to bed, my feet were in much better shape then when I had started the baking. 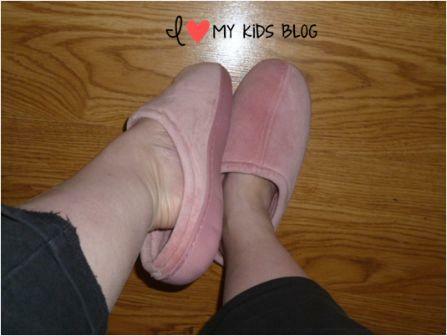 The visco-elastic memory foam had really taken the pressure of my poor feet…these slippers did their job! You can purchase these slippers or the open toed slippers on the nature’s sleep website starting at $25. My feet are so grateful for these slippers. I am contemplating picking up a pair of the open toed ones so my feet will be cooler during the summer months and still get this awesome comfortable support from the Nature’s Sleep Slippers! You can also follow Nature’s Sleep on Facebook, Twitter, Pinterest, and Instagram. You can sign up for their newsletter too to receive the latest news and deals! They have a cool contest going on now until May 30th where they are giving away a brand new mattress (valued at over $2,000!) All you need to do to enter is submit of a photo of why you need a good night’s sleep! CLICK HERE to see the details! 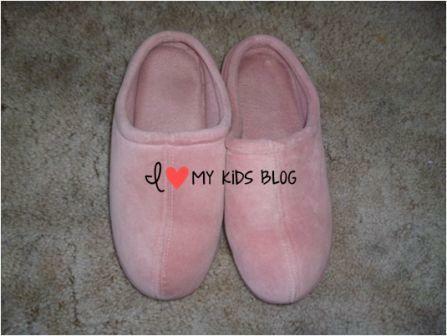 Nature’s Sleep has offered to give away a pair of memory foam slippers to one of my readers. All you need to do is fill out the entry form below. This giveaway is open to Cont. US only and will end at 11:59 pm EST on 5/28. GOOD LUCK! Congrats to our winner Jeri Boss! Jeri, you have been emailed and have 24 hours to reply or a new winner will be chosen! Thanks for participating! Disclosure: I received a pair of slippers to facilitate in this review. regardless of our arrangement I was not required to share a positive review, the opinions above are my own. This post contains affiliate links. I would love to get any pillow from the website. I would love to get any pillow from the website, because they look so comfortable and my head will be very happy! I would like to get the Gel Memory Foam Sofabed Mattress. Our current one is terrible and feel horrible offering it to guests. A memory foam mattress would be wonderful. I would LOVE LOVE LOVE to have the Jupiter Memory Foam Mattress some day! I would love to have a Viscolite Dual Memory Foam Pillow. They look so comfy! I would also love to have the 3″ 4Lbs. Memory Foam Topper. They look incredibly comfy. I’m always on my feet, they could really use a little pampering. Hi I’m Lesley and I love your blog! The content is great and the contests are so much fun 🙂 All of the Natures’s Sleep products look wonderful, but if I could pick something other then the slippers, I would get the Ultimate Power Positioner and a memory foam mattress. I love memory foam products and the combination of the mattress and the positioner would be heavenly. I would love to have the St. Could Memory Foam Mattress!